I’m a fan of public domain pulp weird, horror and adventure fiction. My Kindle can hold a vast reservoir of books and I’m exceedingly cheap, so the public domain is a great source of good stuff. 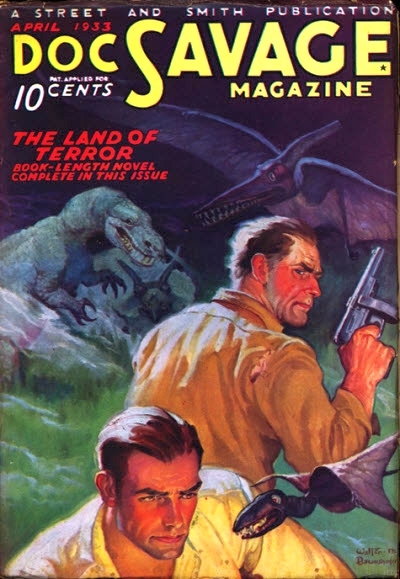 Last night, I just finished reading my son the first two Doc Savage novels, which were published in these monster 100-page magazines for 10 cents a pop in the early 1930s. I admit, I tend to do a little editing as we read along, as these books are a product of the time. I know we look for racism in every corner nowadays, and the first novel, at least, would generally be considered racist by today’s standards–Doc Savage and his team find a lost kingdom of Mayans. After killing some bad guys that were trying to exploit the tribe for their own end, Doc is named a member of the tribe and promised a never-ending supply of gold to right the wrongs of the world with his team of adventurers. I see it more along the lines of Western imperialism, which was more of a cultural default position back then, but there you go. What is perhaps more striking is all the inadvertent homo-eroticism. To put it in context, Doc is the first superhero–essentially Superman without much of the Christ allegory (although, some!). He had a Fortress of Solitude in Arctic, where he would go to devise new inventions or create new medical cures. He, like Buckaroo Banzai 50 years later, had a super-mind. He was a surgeon-scientist-engineering-legal mastermind wrapped in bodily perfection. It is the bodily perfection part that gets a lot of play in these first two novels. “Kenneth Robeson” (Lester Dent) never misses an opportunity to point how physically perfect Doc is. Superheros are new, I get it, but it gets a little weird. Doc is, in reality, quite asexual, although I’m sure, if the character were more popular, it could fill entire queer studies lectures. Summary: Adventurer Doc Savage and his band of adventurers chase a criminal mastermind Kar and his army of disposable goons across 1930s New York and to Thunder Island, home to dinosaurs, prehistoric animals and the secret of the Smoke of Eternity, Kar’s mysterious murder juice. Think Dieselpunk: Doc’s world is full of incredible post-WWI gadgets and gizmos. This will be a New York in the Art Deco sci-fi mold of Metropolis or the Shape of things to Come. Let’s replace Doc’s conventional tri-motor plane with a full-on amphibious flying fortress. Doc and his team carry his machine pistols, which will look like 45’s with little curved magazines attached. They’ll each hold 100s of tiny yet high-impact rounds. Doc Savage, Man of Bronze. Full on earnest boy scout of a character driven to the point of being a little dark. Frankly, the Rock was a great choice, but he needs to be leaner in muscle tone, like his muscles are of metal themselves. And yes, it needs to be played by an actual bronze-skinned person. Doc’s Team: Monk, Renny, Ham, Long Tom and Johnny. I want to see a multi-ethnic cast. Whereas each of them are experts in their respective fields, they posses the foibles Doc doesn’t: womanizing, drinking, etc. Renny usually carries a sword cane. Give each their own distinctive weapons and talents. Long Tom, geologist. Electrical engineer. Give him a goddamn ray gun. Johnny, anthropologist/archaeologist. He’s nerdy with glasses (one lens is a magnifying lens). He’ll carry a machine pistol but make him a martial arts master. Kar: the main villain. The twist in the story is that Kar turns out to be the man the team has been protecting all along. The script would need to build clues up Shyamalan-style, but not has hamfisted as in the book (Ben picked up right away that Bittman was Kar all along).